For similarly named people, see Matt Flynn (disambiguation). Matthew Clayton Flynn (born June 20, 1985) is a former American football quarterback. He was drafted by the Green Bay Packers in the seventh round of the 2008 NFL Draft. He was a member of the Packers when they won Super Bowl XLV over the Pittsburgh Steelers. He played college football at Louisiana State University. Flynn also played for the Seattle Seahawks, Oakland Raiders, Buffalo Bills, New England Patriots, New York Jets, and New Orleans Saints. Flynn, born and raised in Tyler, Texas, is the son of Alvin and Ruth Flynn. Flynn's father, a civil attorney, was a quarterback at Baylor in the 1960s, and his mother is a former collegiate dance team director and choreographer at Kilgore College and Tyler Junior College. Matt has two brothers, Adam and Bill, and two sisters, Rebecca and Amanda. Flynn attended Robert E. Lee High School where he was coached by Mike Owens, and was teammates with Justin Warren, Brandon Pettigrew, and Ciron Black. As a junior in 2001, Flynn completed 101 of 199 passes for 1,650 yards, 13 touchdowns and 9 interceptions for the season, leading Lee to the 5A-I playoffs, where they lost in the second round to eventual state champion Mesquite High School. As a senior, he completed 124 of 206 passes for 1,679 yards and 9 touchdowns, and had 305 yards rushing with 12 touchdowns. Flynn displayed toughness by leading Robert E. Lee High School to a semifinal appearance despite playing his last four games with a broken foot. His team lost to Midland High School 24–14. After his senior season, 247 Sports listed Flynn as the top-rated Texas high school quarterback in 2003. Flynn was a member of the SuperPrep Texas 124, the Dallas Morning News Texas Top 100 and the Tyler Morning Telegraph All-East Texas Football Team. He chose LSU over Tennessee, Texas Tech, and Texas A&M. Flynn redshirted the 2003 season at LSU. In 2004, he served as third-string quarterback behind starter Marcus Randall and backup JaMarcus Russell. He also doubled as LSU's holder on placekicks. Flynn played in all 12 games, but only three games as quarterback. His collegiate first completion went to Xavier Carter for a 67-yard touchdown against Mississippi State. Flynn also made a short appearance in the 2004 Capital One Bowl, completing 1 of 4 passes for 11 yards in a 25–30 losing effort against Iowa. He finished the season with 4 completions on 10 attempts for 99 yards and 1 touchdown. The departure of Randall left Russell and Flynn battling for the starting quarterback position in the 2005 season. Russell eventually got the job, leaving Flynn as backup. He played in seven games at quarterback for the Tigers in 2005, completing 27 of 48 passes for 457 yards, 7 touchdowns and 1 interception. In a win over North Texas, Flynn threw a perfect 7-of-7 for 139 yards and 3 touchdowns, all in the fourth quarter. In the 2005 SEC Championship Game against the Georgia Bulldogs, starting quarterback Russell was injured and Flynn finished the game. He was then given the nod to start for the Tigers in the 2005 Chick-fil-A Peach Bowl against the University of Miami Hurricanes. In that game, he led the Tigers to a 40–3 rout of Miami. In 2006, Flynn again served as backup to Russell, appearing in seven games. He completed 12 of 20 passes for 133 yards over the season, recording 2 touchdowns and 1 interception. Both touchdowns came in a 49–0 rout against Kentucky on October 14, 2006. Matt Flynn (No. 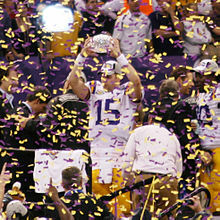 15) quarterbacks the LSU Tigers during the 2008 BCS National Championship Game against the Ohio State Buckeyes. Matt Flynn holds up the AFCA National Championship Trophy. With JaMarcus Russell's departure, Flynn became a starter as a fifth-year senior. He started every game that season except the SEC Championship in which he was injured. He finished the season with 2,407 passing yards, 21 touchdowns and 11 interceptions. In addition, he rushed for 215 yards and 4 touchdowns. Flynn threw a 22-yard touchdown pass to Demetrius Byrd to win the game against Auburn on October 20, 2007 with 1 second remaining on the clock; Colt David kicked the extra point to make the final score LSU 30, Auburn 24. He then led the Tigers to a 4th quarter comeback against Alabama. Flynn and the Tigers then beat Louisiana Tech the following weekend and climb back to the #1 spot after a loss by then-#1 Ohio State. The following week the Tigers beat Ole Miss. In his final game at Tiger Stadium, Flynn and the Tigers lost to Arkansas, seemingly losing any chance at the national title. However, LSU, without Flynn, beat Tennessee for the SEC Championship, and losses by Missouri and West Virginia vaulted LSU back into the title game in New Orleans. On January 7, 2008, Flynn led LSU to a BCS National Championship, beating Ohio State 38–24. Flynn completed 19 of 27 passes and 4 touchdowns, and was named offensive MVP of the game. The Tigers finished the season ranked No. 1 in the polls. All values are from the NFL Scouting Combine. Flynn was drafted by the Green Bay Packers in the 7th round (209th overall) of the 2008 NFL Draft. On July 23, he was signed to a four-year rookie contract through the 2011 season. In 2008, he won the competition for the back-up role to Aaron Rodgers, beating out fellow rookie and second-round pick Brian Brohm. Flynn was seen as being less talented than Brohm because of Brohm's superior size, arm and foot speed, coupled with the fact that Brohm was selected much higher in the draft compared to Flynn. On December 19, 2010, Flynn made his first NFL start against the New England Patriots after starting quarterback Aaron Rodgers was not cleared medically to start. 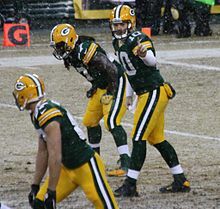 Flynn threw three touchdown passes; one each to John Kuhn, James Jones and Greg Jennings against New England, but threw an interception that was returned by Kyle Arrington for a touchdown in the second half. The game went down to the final play when Flynn, with the ball at the New England 15-yard line, lost it when he was sacked. The Packers lost the game 31–27. Flynn completed 23 of 37 passes for 254 yards in the loss. On January 1, 2012, Flynn started the final game of the season against the Detroit Lions. He threw for 480 yards and 6 touchdowns in the 45–41 victory, both of which set single game Packers records. Flynn was the backup to Aaron Rodgers when the Packers won Super Bowl XLV on February 6, 2012. On March 18, 2012, Flynn signed a three-year deal with the Seattle Seahawks worth $20.5 million, with $9 million guaranteed. He decided to wear the number 15, his number from college. Flynn competed with 2011 starting quarterback Tarvaris Jackson and 2012 NFL draft third round pick Russell Wilson for the starting quarterback position. When Wilson was named the starter, it made Flynn and his contract expendable. On April 2, 2013, the Seahawks traded Flynn to the Oakland Raiders for a 2014 5th round pick and a conditional 2015 draft pick. He was brought in to compete with 2013 NFL draft fourth round pick Tyler Wilson and 2011 NFL draft supplemental third round pick Terrelle Pryor for the starting quarterback position, with Pryor winning the starting job in preseason. He was assigned number 15. Flynn relieved an injured Pryor in a Week 3 match-up against the Broncos, completing 1 out of 2 passes for 19 yards in a 37–21 loss. With Pryor's concussion preventing him from starting the next week against the Redskins, Flynn started and completed 21 out of 32 passes for 227 yards with one touchdown pass and one interception (which was returned for a Redskins touchdown) in a 24–14 loss. Several days later, Raiders coach Dennis Allen announced Flynn's demotion to third-string behind Pryor and undrafted rookie Matt McGloin. On October 7, 2013, the Raiders released Flynn just six months after bringing him in to be the starter. On October 14, 2013, Flynn worked out with the Buffalo Bills with rookie and starting quarterback EJ Manuel out 6–8 weeks with a knee injury, and backup Thad Lewis injured during a game against the Cincinnati Bengals. He signed with the Bills on October 14, 2013. He was assigned number 17. Flynn did not see any playing time in Buffalo and primarily served as an emergency replacement should third-string quarterback Jeff Tuel also be hurt. After Lewis and Manuel recovered from their injuries, Flynn was released on November 4, 2013. On November 12, 2013, due to injuries to starting quarterback Aaron Rodgers and backup quarterback Seneca Wallace, Flynn was re-signed by Green Bay to be the backup for Scott Tolzien. On November 24, 2013, Flynn was brought in to relieve the struggling Tolzien midway through the 3rd quarter. Flynn rallied the team from a 23–7 deficit at the beginning of the 4th quarter. The game went to overtime with a 23–23 score. The Packers struck first in overtime with a field goal, but due to the NFL's new regular season overtime rules, the Vikings got the ball back and also scored a field goal. The game ended in a 26–26 tie. On November 27, 2013, it was announced that Flynn would be the starting quarterback for the Thanksgiving game against the Detroit Lions. Flynn struggled, only completing 10 of 20 attempts for 139 yards with one interception and two fumbles. He was sacked 7 times, including one in the end zone for a safety. The Packers lost 40–10. On December 15, 2013, Flynn led the Packers from a 26–3 deficit against the Cowboys at halftime to come out with a 37–36 victory. He led five consecutive touchdown drives in the 2nd half, and threw for 299 yards with 4 touchdowns and 1 interception. On December 22, 2013, Flynn threw for 232 yards with 1 touchdown and 1 interception in a 38–31 loss to the Pittsburgh Steelers. His contract expired at the end of the season. On April 15, 2014, Flynn was given a new 1-year deal with the team worth $1.07 million. During his final season with the Green Bay Packers, Flynn appeared in four games, and finished the season with 66 yards, no touchdowns and one interception. Flynn was not re-signed and became a free agent on March 8, 2015. Flynn was signed by the New England Patriots on June 11, 2015. Flynn would add a veteran presence for second-year quarterback Jimmy Garoppolo for four games due to the suspension of Tom Brady. He was assigned number 8. On August 10, 2015, the Patriots released Flynn to make room for Ryan Lindley. Flynn was signed by the New York Jets on August 19, 2015 to a one-year contract. He was assigned number 5. On September 3, 2015, Flynn started the Jets' preseason week 4 match-up against the Philadelphia Eagles, throwing 10–14 for 136 yards, 2 touchdowns, and 1 interception. On September 5, 2015, Flynn was released. Flynn worked out for the Dallas Cowboys in September but was unsigned. On November 15, 2015, Flynn was signed by the New Orleans Saints after back-up quarterback Luke McCown suffered a season-ending injury. 2015 marked the first season in Flynn's career in which he did not appear in a regular season game. Flynn married his long-time girlfriend Lacey Minchew on June 22, 2013. ^ a b c Amato, Laura (August 21, 2015). "Matt Flynn: 5 Fast Facts You Need to Know". heavy.com. Retrieved April 10, 2019. ^ "Alvin Flynn College Statistics". sports-reference.com. Retrieved April 8, 2019. ^ "Rangerette History". Rangerette.com. Retrieved April 8, 2019. ^ "Apache Belle Directors". tjc.com. Retrieved April 8, 2019. ^ "Professional Red Raiders". Tyler Lee Football. Retrieved December 30, 2018. ^ "Football State Archives: 5A Division I 2001-2002 Playoff Bracket" (PDF). University Interscholastic League. Retrieved December 30, 2018. ^ "Football State Archives: 5A Division I 2002-2003 Playoff Bracket" (PDF). University Interscholastic League. Retrieved December 30, 2018. ^ "2003 Top Football Recruits in Texas". 247 Sports. Retrieved December 29, 2018. ^ Emfinger, Max (April 12, 2002). "An early look: Six golden nugget quarterbacks". USATODAY.com. Retrieved April 8, 2019. ^ Higgins, Ron (September 6, 2007). "Flynn's attitude keys Tigers' smooth QB transition". Retrieved April 8, 2019. ^ "Matt Flynn CFB Stats". sports-reference.com. Retrieved April 7, 2019. ^ "Matt Flynn". NFL Draft Scout. Retrieved August 17, 2013. ^ "Matt Flynn Combine Player Profile". NFL. 2008. Retrieved August 17, 2013. ^ PackersNews.com (July 24, 2008). "Poppinga gets a four-year contract extension, plus other salary info". greenbaypressgazette.com. Retrieved July 24, 2008. ^ Wilde, Jason (September 2, 2008). "In surprise move, Packers give punter Ryan the boot". Retrieved October 7, 2013. ^ Tom Silverstein (August 18, 2008). "Brohm holds slim lead". JSOnline. Archived from the original on September 13, 2008. Retrieved October 6, 2008. ^ Green Bay Press Gazette (December 19, 2010). "Green Bay Packers LOLB Matt Flynn has fine 1st road start". Green Bay Press Gazette. Archived from the original on July 16, 2012. Retrieved December 20, 2010. ^ Associated Press (December 19, 2010). "Pats find worthy adversary in Flynn, hold off Pack for sixth straight". NFL.com. Retrieved December 20, 2010. ^ a b "Russell Wilson named starting QB by Seattle Seahawks". NFL.com. August 26, 2012. Retrieved August 26, 2012. ^ Darin Gantt (April 1, 2013). "Flynn's a Raider for '14 fifth and a conditional pick". ProFootballTalk.com. Retrieved April 7, 2019. ^ Darin Gantt (April 1, 2013). "Report: Flynn-to-Raiders deal done". ProFootballTalk.com. Retrieved April 7, 2019. ^ "Raiders acquire QB Matt Flynn in trade with Seahawks". Archived from the original on April 12, 2013. Retrieved April 2, 2013. ^ Marc Sessler (July 28, 2013). "Matt Flynn reportedly top QB at Oakland Raiders camp". NFL.com. Around the NFL. Retrieved April 7, 2019. ^ Bair, Scott (October 2, 2013). "Allen: Pryor to start on Sunday". CSN Bay Area. Archived from the original on October 2, 2013. ^ Rosenthal, Gregg (October 14, 2013). "Matt Flynn, Buffalo Bills strike contract; QB mix grows". National Football League. Retrieved October 14, 2013. ^ "Packers sign Matt Flynn, place Seneca Wallace on IR". November 12, 2013. Archived from the original on December 5, 2013. ^ Pelissero, Tom (November 24, 2013). "Matt Flynn helps Packers salvage 26-26 tie with Vikings". USA TODAY Sports. ^ "Lions get first Thanksgiving win in 10 years". ESPN. November 28, 2013. Retrieved April 7, 2019. ^ "Packers come back from 23 down to stun Tony Romo, Cowboys". ESPN. December 16, 2013. Retrieved April 7, 2019. ^ "National Football League Game Summary" (PDF). National Football League. February 25, 2014. Retrieved April 7, 2019. ^ Demovsky, Rob (April 15, 2014). "Matt Flynn returning to Packers". ESPN. Retrieved April 7, 2019. ^ "Matt Flynn Career Earnings". Retrieved April 7, 2019. ^ Kyed, Doug. "Reports: Patriots Sign Quarterback Matt Flynn, Waive Garrett Gilbert". NESN. Retrieved June 11, 2015. ^ Duffy, Kevin (August 10, 2015). "New England Patriots transactions: Matt Flynn out, Ryan Lindley in at quarterback". Mass Live. Retrieved April 16, 2019. ^ Lange, Randy (August 19, 2015). "Jets Sign Free Agent QB Matt Flynn". New York Jets. Archived from the original on August 19, 2015. Retrieved August 19, 2015. ^ "Eagles vs. Jets - Box Score - September 3, 2015 - ESPN". ESPN.com. Retrieved March 1, 2016. ^ "Former LSU quarterback Matt Flynn to sign with Saints, source says". NOLA.com. Retrieved March 1, 2016. ^ NESN Staff (June 12, 2015). "New Patriots QB Matt Flynn's Wife Is A Former Miss Louisiana (Photos)". NESN. Retrieved April 8, 2019. ^ Staff Writer (June 12, 2015). "Lacey Minchew, Matt Flynn's Wife: 5 Fast Facts You Need to Know". Heavy.com. ^ "Matt Flynn Career Statistics". NFL.com. Retrieved April 8, 2019. 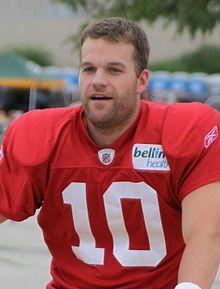 Wikimedia Commons has media related to Matt Flynn.